Being the original Lazy Cyclist* the weather forecast for the Wheels on Wednesday ride looked formidable. Hot northerly winds of 35-45kph were predicted. Any ride starting and finishing at our usual starting place would have to include at least some riding into this gale. That’s not a ride the Lazy Cyclist wants to undertake if there’s an alternative. Where could we ride making use of the wind, avoiding riding against it, and without hills? Alarms were set for pre-dawn and those taking the train travelled independently to Southern Cross, rugged up against the 7C temperature in Geelong, meeting in time for a coffee for some, before the short ride down the bike path to Docklands. No cows in sight, but lots of cyclists, mainly fast commuters making for the CBD. We stopped near the old Sydney ferry and were just about to phone the Port group when they appeared from around the big cow – which wasn’t on the bike path, but over towards the dock, much larger and more box-shaped than the real thing, but certainly upside down up a tree. They were right on time after their most enjoyable 90minute cruise across the bay. A late cyclist (John M – who else?) phoned from Southern Cross, but soon joined the group which had swelled to 10 – Chris, Terry, Gerry and Paul from the ferry, John M, Ian, Doug, Russell, Neville, and the LC. As predicted the wind strengthened and the temperature rose steadily. Conditions were great for a fast ride – along the Footscray Road Bike path to Summerville Road, old Geelong Road and onto the traffic-free Federation Trail to Hoppers Crossing for an early coffee break at 10.20am. From there the Federation Trail winds its way through Werribee. I put my hand up as the one who made the wrong turn near the new section at Sneydes Road – into Werribee’s heavy traffic instead of back towards the Federation Trail. With a shortcut along the Werribee River we regained the correct route, cycled under the highway and onto the Geelong Road where wind and truck assist helped us on our way at a spanking 30kph or so. A rest at Little River Service Centre gave legs a rest and various liquids and nutriments were consumed and water bottles refilled. The biggest hazard on this section (apart from a wayward truck who was well into the bike lane) is the exits and entries but these were safely negotiated before the group arrived at the North Shore turnoff with (for me, at least) a feeling of relief to be out of the heavy fast traffic. The wind had taken a westerly turn, and was gusty at times, but still hot. The ferry contingent were cycling back to Portarlington after a lunch stop on the waterfront. 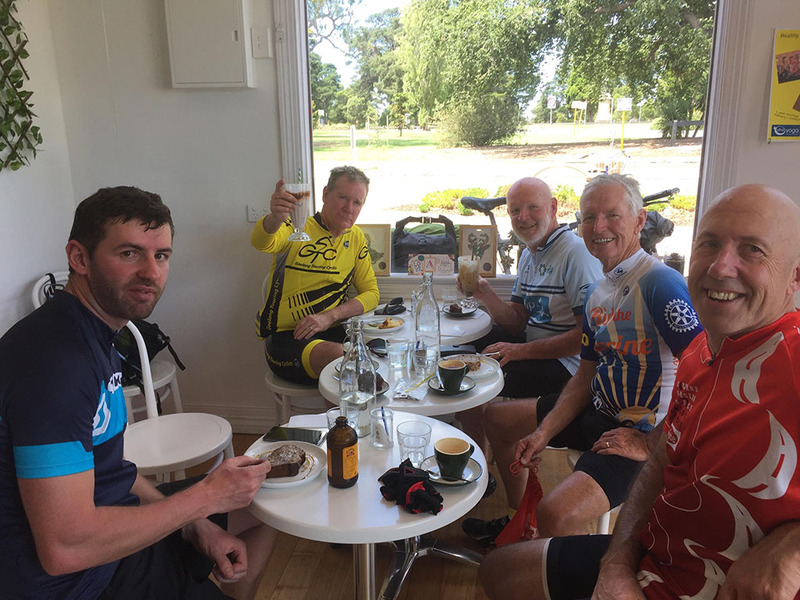 This meant that their ride total for the day would be around 110km – a shortened ATB assisted by the ferry ride from Portarlington to Docklands. The tail wind should have made this reasonably easy (though, as the Lazy Cyclist, I didn’t envy them the hills between Drysdale and Portarlington). Thanks to all my fellow cyclists who, once again, rode at a pace with which I could keep up and enjoy the ride. * The Lazy Person’s Guide to Cycling and The Lazy Cyclist’s Guides were published Flashing Pedals in 2008. ** Christian plans to cycle the Great Ocean Road to Warrnambool, then come back to Geelong to take the Queenscliff ferry across to Mornington Peninsula and on to Phillip Island. We wish this intrepid pedaller a most enjoyable and trouble-free tour – a smooth road and a tail wind. This entry was posted in Ride reports and tagged Federation Trail, Wheels on Wednesday by hlyth2013. Bookmark the permalink. Pity not everyone was made aware of the change in program. We checked the cycling calendar Tuesday night and Wednesday morning. No change in post so I was there at Rippleside at 8 very lonely in deed.